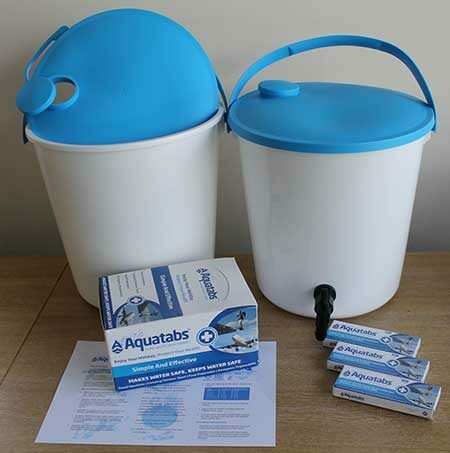 Our Household Water Purification Kits are designed to help prevent illness caused by drinking contaminated water by providing the means to transform dirty, discoloured water into clean, safe drinking water at household level. The kits are available in two formats, one for turbid water and one for non turbid water. 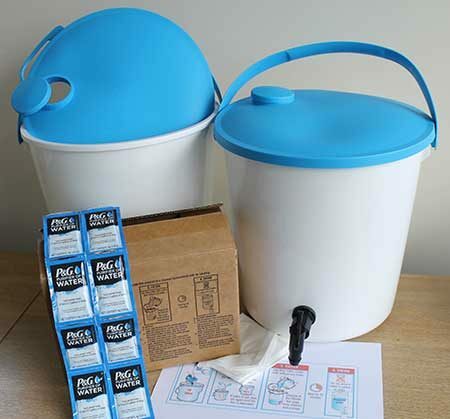 Each kit contains sufficient equipment for collection and purification of dirty water for a family of five for up to 30 days. Kits are supplied in pallet quantities. Diarrhoea caused by drinking contaminated water is still a leading cause of illness and death among infants and children in the developing world. Around 1.8 million children die every year as a result of diseases that cause diarrhoea. IRC/A8:1 for turbid water, pallet quantity. IRC/A8:2 for non turbid water, pallet quantity. 2 x large plastic buckets, one with a dispensing tap and one without tap.